Gastronomixs English: Ceviche? Carpaccio? No, tiradito! Asia meets South America in this wonderfully tasty fish dish! Have you ever made it? Tiradito is a Peruvian variation on ceviche and sashimi. This dish consists of fine strips of chilled raw fish topped with a spicy salsa made from lemon juice and various other ingredients. Unlike most ceviches, the fish is not marinated but, instead, covered with the mixture; it is actually a kind of sashimi with a spicy sauce. Nor does tiradito contain raw onions. What is essential for a good tiradito, however, is the freshest fish you can find. Salmon and tuna are obvious and delicious choices, but why not try mackerel or scallops? Once you've ticked the fish off the list, make sure you have a sharp knife. Get the ripest, juiciest lemons and/or limes and mix them with aji amarillo paste, a Peruvian paste made from spicy yellow peppers. Finish off your dish with a variety of toppings, such as coriander, cooked sweetcorn, crunchy potato (crisps) or pickled jalapeño. With so many possibilities, it's the perfect dish for you to bring your creative ideas to life! 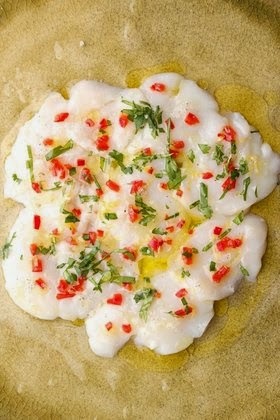 At Gastronomixs you'll find a recipe for scallop tiradito!